Hello, all! Today we have an excellent breakfast recipe, because I am a firm believer that breakfast should never be skipped. 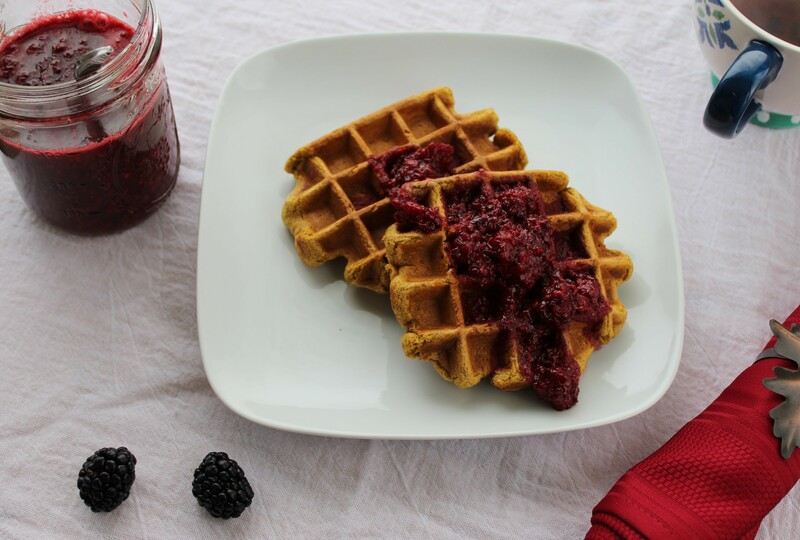 Say good morning to PUMPKIN CINNAMON WAFFLES WITH BLACKBERRY SAUCE!!!!!! I’m pretty obsessed with pumpkin in general right now. I’m overloading on it before fall is officially over – which is not until December 21, of course, but everyone knows the real first day of winter here in the U.S. is the day after Thanksgiving, when Christmas shenanigans unequivocally ensue. Obvi, we can all still eat pumpkin after Thanksgiving – and I definitely think we should. It’s such a versatile ingredient, excellent roasted and thrown into salads, pureed to make soups and sauces, and baked into pies, cookies (such as my Pumpkin Chocolate Chip Cookie Bars), and other baked goods. It also touts such goodies as superhero-like levels of vitamin A, potassium, fiber, and beta-carotene, an antioxidant thought by some to be a cancer deterrent. Take that, cancer! 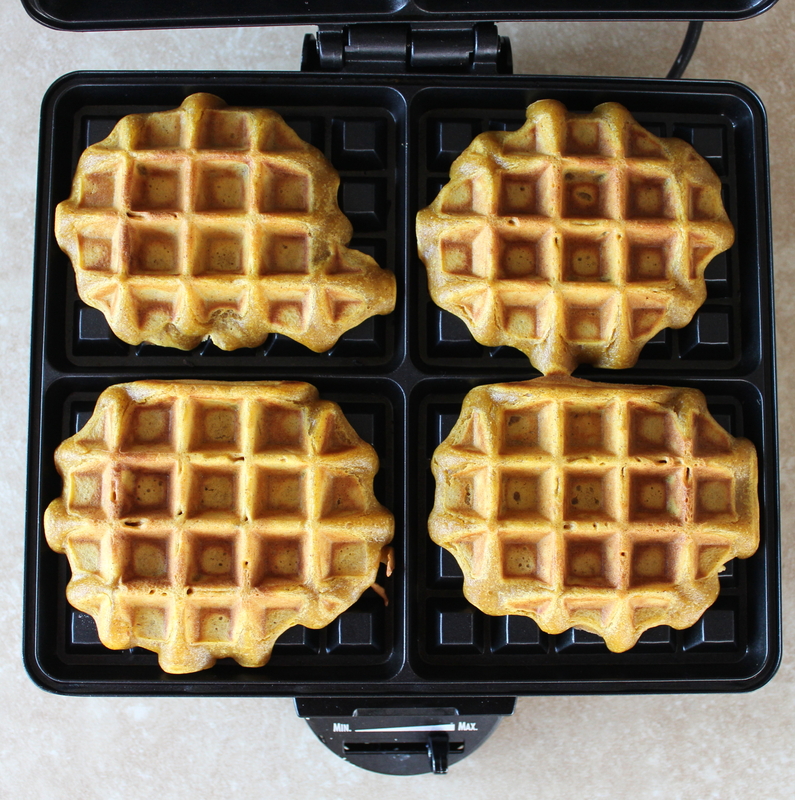 Why else are these waffles great besides being loaded with yum-yum pumpkin? They are processed sugar-free – HOORAY! No baddie white sugar in these guys or in the accompanying blackberry sauce; instead, the natural sweeteners of honey and pure maple syrup are used. Speaking of blackberries, let’s face it: they are not in season anymore. But I’m generally looking for any excuse to buy fresh berries. I know that’s totally un-locavore of me, and I do admire the locavore movement and try to at least roughly adhere to it and with eating with the seasons. But fresh berries are a weakness of mine, a spot of sunshine in these increasingly shorter pre-winter days. So I will buy them here and there this winter – and I totally advocate you doing that and making this blackberry sauce if you feel the same way. 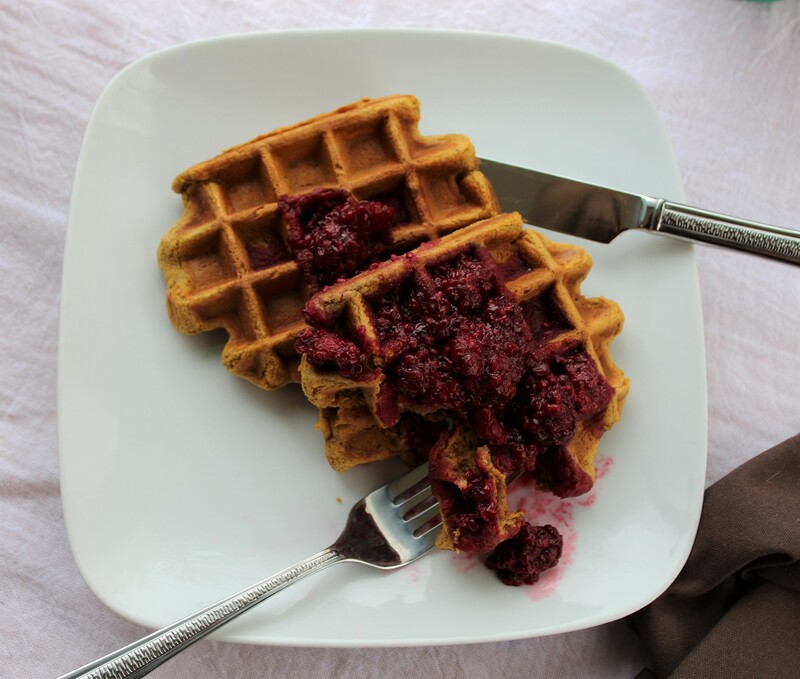 It’s a delicious and healthful accompaniment to the waffles – though of course, some butter and maple syrup and crushed walnuts would be lovely with them, too. Or if you can’t find fresh blackberries, you can always substitute frozen ones or use raspberries. In a large mixing bowl, combine the dry ingredients – the flour, baking soda, and cinnamon. Grab another bowl and crack the egg into it. 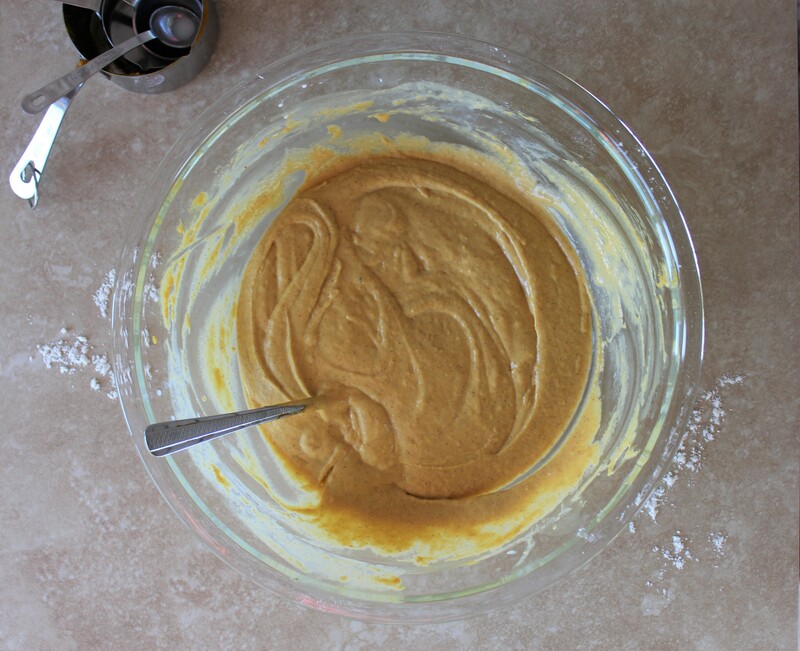 Whisk well, then stir in the pumpkin, milk, maple syrup, melted butter, and vanilla. Add the wet ingredients to the dry ingredients and mix thoroughly. Add the blackberries to a medium-sized saucepan. Mash them with a potato masher, then add the honey and lemon juice and place over medium heat until the mixture comes to a boil. Let cook and thicken for about 5 minutes, stirring frequently and reducing heat as needed. Then remove from heat. Preheat your waffle iron as needed, then pour the batter in and cook until the waffles are golden brown and have a nice crust on the outside. The time will be different for each waffle iron; for mine, it takes about four to five minutes. Topped cooked waffles with the blackberry sauce, and voilá! You have a special breakfast treat. Makes six to eight waffles, depending on size.